Enjoy brand-new video converting & editing experience across your mobile devices. Constantly update to support upcoming mobile devices, no upgrade fee. Buy now, enjoy high quality HD video converter solution today. Pack with WinX DVD Ripper Platinum, DVD Copy Pro, VideoProc and MediaTrans. Your media solution to rip DVD; duplicate DVD disc; download/convert videos; transfer and manage iOS files. 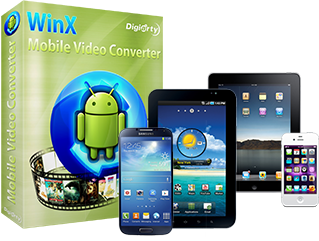 Convert MKV, AVI, MP4, WMV, MOV, AVCHD, M2TS videos to any Android mobiles like Samsung Galaxy Note/S, The New HTC One, Kindle Fire, Google Nexus 7. Convert videos to Apple iPhone 4S/5/5S/5C/6 (Plus)/7 (Plus)/8 (Plus)/X, iPad Mini, iPad 4, WP8, Microsoft and Nokia mobiles. Eligible universities, educational institutions, academic resellers, non-profit organizations and government agencies can purchase our products with academic discount pricing. For students, faculty or staff members at any grade level of accredited colleges, universities and other institutions, we also provide special discount.